Nadia Murad (left) and Dr. Denis Mukwege (right) were awarded the 2018 Nobel Peace Prize. OSLO — The Nobel Peace Prize on Friday was awarded to a Congolese doctor and an Iraqi woman who once was a captive of the Islamic State group for their work to highlight and eliminate the use of sexual violence as a weapon of war. 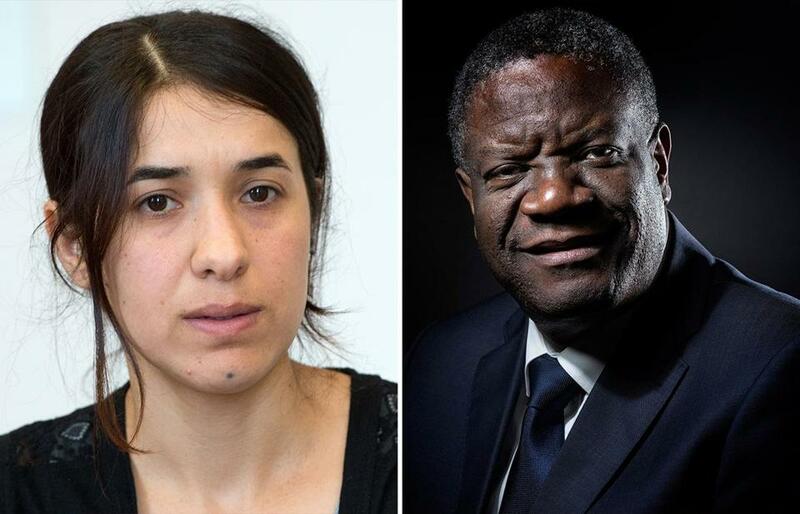 Dr. Denis Mukwege and Nadia Murad ‘‘have made a crucial contribution to focusing attention on, and combating, such war crimes,’’ the Norwegian Nobel Committee said in its announcement. ‘‘We want to send a message that women who constitute half the population in those communities actually are used as weapons and that they need protection, and that the perpetrators have to be prosecuted and held responsible,’’ said Berit Reiss-Andersen, chairwoman of the Norwegian committee. The award comes amid heightened attention to sexual abuse of women in the workplace and socially, broadly referred to as the ‘‘#metoo’’ movement. ‘‘Metoo and war crimes is not quite the same thing, but they do however have in common that it is important to see the suffering of women,’’ said Reiss-Andersen. In other Nobel prizes this year, the medicine prize went Monday to James Allison of the University of Texas M.D. Anderson Cancer Center and Tasuku Honjo of Kyoto University, whose discoveries helped cancer doctors fight many advanced-stage tumors and save an ‘‘untold’’ numbers of lives. On Wednesday, three researchers who ‘‘harnessed the power of evolution’’ to produce enzymes and antibodies that have led to a new best-selling drug won the Nobel Prize in chemistry.